You are here:Home Updates Welcome! Welcome to the re-launch of Tom Bathgate Voice Studio! Tom has joined forces with another teacher, Laura, to create Your Voice Studio, and they are here to help you with your singing. 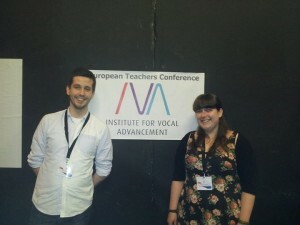 Tom and Laura have been working behind the scenes for the past 12 months to create Your Voice Studio – the studio with a mission to teach better singing. For our current students, you now have access to a wealth of information and a weekly blog packed full of tips and tricks, but this is only the beginning. We still have some more exciting things we are working on behind the scenes, so you need to stay tuned and sign up for our monthly email to find out about them! For our new or prospective students – welcome! Here you will find everything you need to know about our vocal studio, about the teachers and the technique, and all before you come for your first lesson. There is still a lot more information to be imparted to you, but don’t let us decide for you, you’ll have to come and try a lesson out for yourself! Your Voice Studio has the only Certified IVA Instructors in Scotland licensed to teach the IVA Technique – a revolutionary teaching method designed to get results in your voice, fast. Regular lessons with a Certified Teacher and a little dedicated practice from yourselves will see permanent results with your voice. Remember though, lessons can only take you so far – you need to commit to your voice as much as we will commit to helping you! Come and join us on Facebook, Twitter and Google+! We love questions, so why not ask about that thing you’ve been wondering about? We’ll also be doing video blogs, so go ahead and suggest things for us to talk about. We can’t promise to do each and every one of your suggestions, but as always, we’ll do our best for our students. That’s all from us for now – go ahead and sign up to our weekly newsletter, or get in touch for your next lesson. We’re always available to help, so don’t be shy!